Background: Alginate lyases belonging to polysaccharide lyase family-7 (PL-7) are the most well studied on their structures and functions among whole alginate lyases. However, all characterized PL- 7 alginate lyases are from prokaryotic bacteria cells. Here we report the first identification of eukaryotic PL-7 alginate lyase from marine red alga Pyropia yezoensis. Methods: The cDNA encoding an alginate lyase PyAly was cloned and was used for the construction of recombinant PyAly (rPyAly) expression system in Escherichia coli. Purified rPyAly was assayed to identify its enzymatic properties. Its expression pattern in P. yessoensis was also investigated. Results: PyAly is likely a secreted protein consisting of an N-terminal signal peptide of 25 residues and a catalytic domain of 216 residues. The amino-acid sequence of the catalytic domain showed 19-29% identities to those of bacterial characterized alginate lyases classified into family PL-7. Recombinant PyAly protein, rPyAly, which was produced with E. coli BL21(DE3) by cold-inducible expression system, drastically decreased the viscosity of alginate solution in the early stage of reaction. The most preferable substrate for rPyAly was the poly(M) of alginate with an optimal temperature and pH at 35oC and 8.0, respectively. After reaction, unsaturated tri- and tetra-saccharides were produced from poly(M) as major end products. These enzymatic properties indicated that PyAly is an endolytic alginate lyase belonging to PL-7. Moreover, we found that the PyAly gene is split into 4 exons with 3 introns. PyAly was also specifically expressed in the gametophytic haplopid stage. 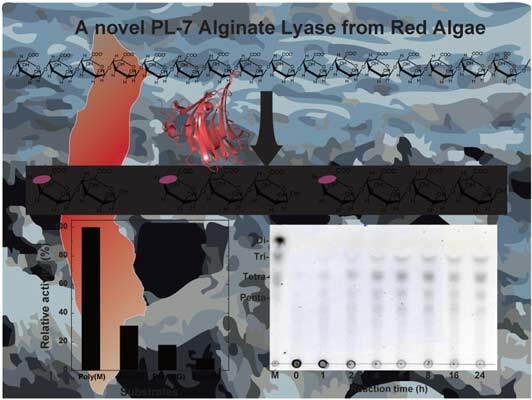 Conclusion: This study demonstrates that PyAly in marine red alga P. yezoensis is a novel PL-7 alginate lyase with an endolytic manner. PyAly is a gametophyte-specifically expressed protein and its structural gene is composed of four exons and three introns. Thus, PyAly is the first enzymatically characterized eukaryotic PL-7 alginate lyase. Alginate, Alginate lyase, poly(M) lyase, Family PL-7, Pyropia yezoensis, Red algae. Graduate School of Fisheries Sciences, Hokkaido University, 3-1-1 Minato-cho Hakodate, Hokkaido 041-8611, Japan.